The winter months are rough on delicate plants. The temperature could get so cold that the plants can't survive outdoors. I've experimented with transplanting my plants to into planters. By far a large amount of time I spent is on planning where I should move the plants to. and how I am going to care for it, since it won’t be on a sprinkler system. In the end, it is worth all the effort to me, because they seemed to be much happier when not left in the garden. One of my perennials that have been transferred into an outdoor planter actually still has blooms as we speak right now. Speaking of planters I could use some upgrading to my indoor planters. I love the looks of the indoor planter pictured here, it’s so sleek looking and can hold quite many plants at a time. The planters I have some now are all mixed and matched, and worn out looking. I am looking forward to investing in some decorative planters and moving one of my most thriving African Violets to a real decorative planter. Again, this process will take some time to migrate and to figure out what theme I might want to go with. The planters pictured here are so professional looking. It should be able to help me stay uniformed yet uniquely decorative. 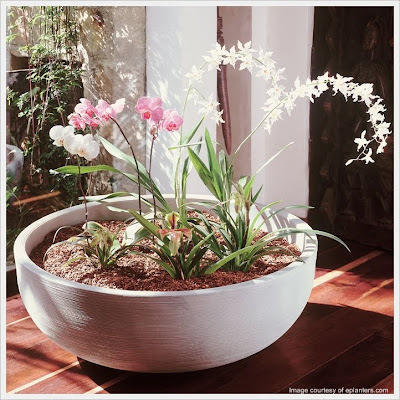 Beautiful planters that I would love to have! love the planters especially the last one.